If you and your family like outdoor recreation, especially that involves water; you may want to look at getting a water trampoline. 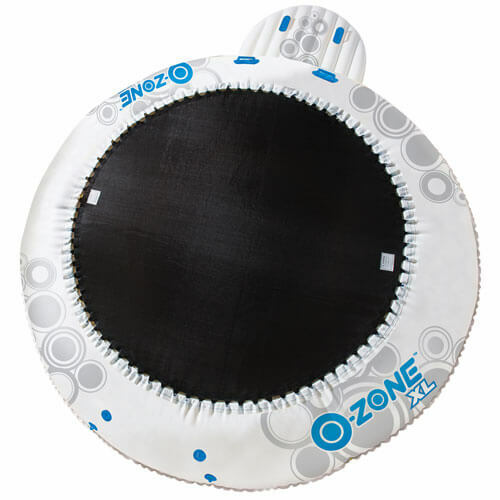 A water trampoline is a fun way to enjoy the outdoors and get some good exercise. Water trampolines have springs held by a metal frame. The frame and springs lay on top of a large inflatable tube. The tube is anchored with a rope, so the range of motion is limited. There are various sizes of trampolines. There are some as large as 25 feet! That is a lot of space for a lot of fun. The measurement includes the tubing, so the jumping surface is closer to 17 feet. Most are round, but you can also find square models. Most trampolines for water will come with at least one ladder to make the trampoline accessible. If they don’t you will want to purchase one to accompany the trampoline with it. 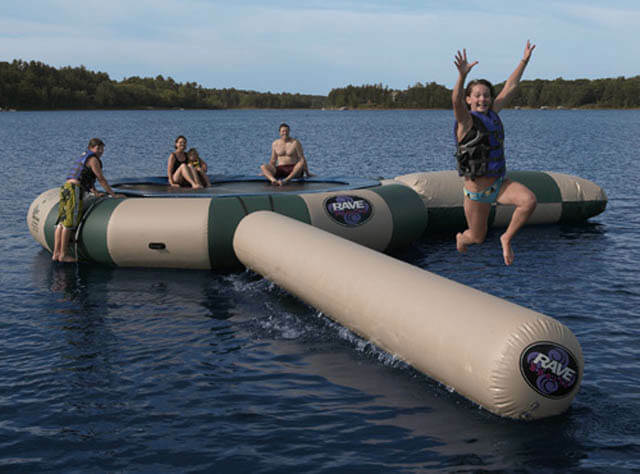 An inflatable water trampoline allows similar activity to take place on it as does a traditional trampoline, only on water. The fact is, water actualy increases options for fun, because you can use water for number of activities. You can also use accessories for your trampoline that will increase the activities can do with it. One of the most popular additions is a water trampoline slide. The slide is inflatable and attaches to the side of the trampoline. Pay attention to the manufacturer’s directions that will let you know what type of safety precautions you should take when using the slide, including how deep the water should be. The first trampoline designed for water in the USA was the Rave Aqua Jump. You can still purchase trampolines from Aqua Jump. They are a reputable name in the business. Their prices range from around $1000 for the smallest model, and up to $4,799 for the largest model. 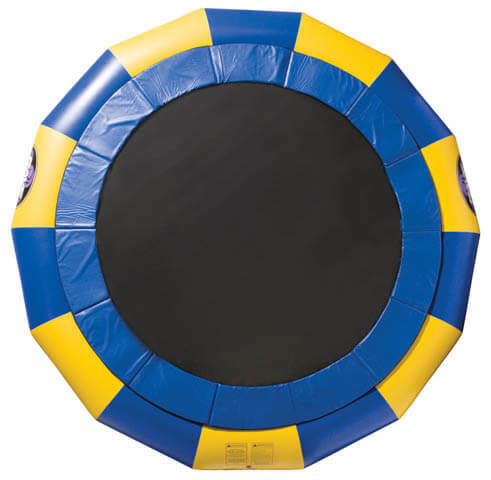 You can also purchase accessories for the trampoline from Aqua Jump. As you can see, purchasing such a trampoline can get pretty expensive. 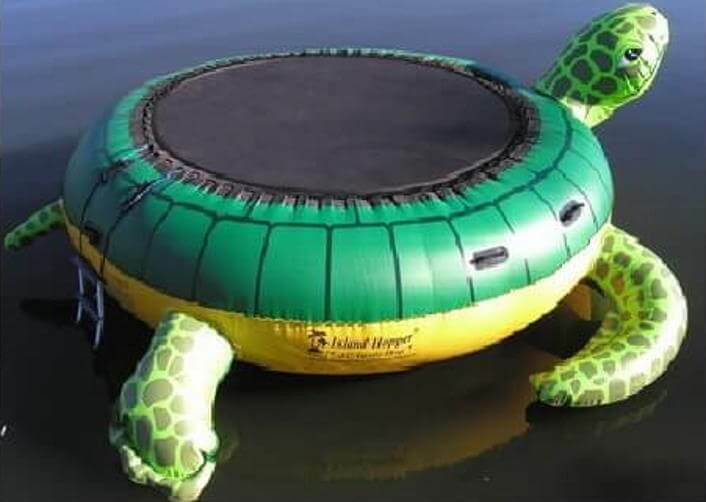 One way to save on cost is purchasing a used water trampoline. If you do decide to purchase used, you will want to make sure the trampoline is still in good condition. If you don’t want to own a water trampoline you can easy rent it. This way you can enjoy the use of the trampoline for special occasions and don’t have to own it. Availability of rentals depends on where you live. You are more likely to find rentals in areas with large bodies of water. Renting pricing varies with each company, but you can find rentals for about $300 per day. Some companies also provide a discount for renting for several days or a week. Rental usually includes set up and dis-assembly. 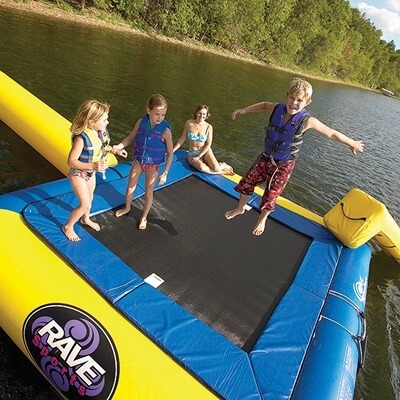 If you would like to know more about Rave water trampolines and read customer testimonials go here. How Fun Water trampolines really are? No need to explain any more, just check video below!